Perched on its own glistening blue bay on the exquisite Caribbean island of St. Lucia, BodyHoliday Saint Lucia offers a complete 'Body Holiday' for body and mind, focused on outdoor fitness balanced by relaxation at the sublime Oasis Spa. 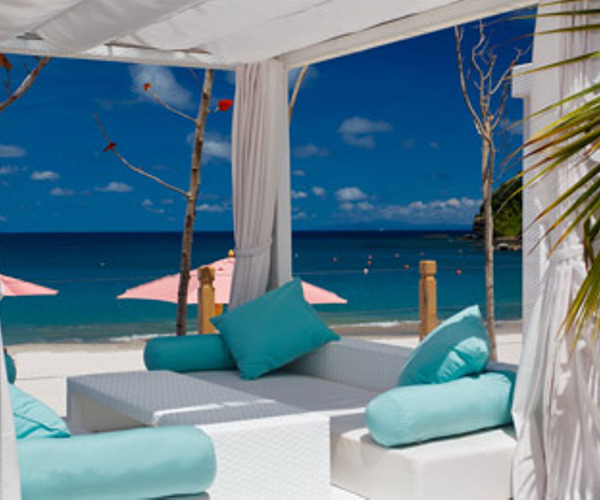 Saint Lucia is the ultimate getaway for body and mind. Set on a secluded cove of a white sand beach at the edge of the Caribbean Sea, and surrounded by tropical gardens and rain-forest, BodyHoliday is recognized as one of the finest destination resorts and centres of well-being. There couldn’t be a more idyllic corner of the world to escape to, offering a truly blissful vacation designed for and by you. The Wellness Centre, a building inspired by the white-washed architecture of the Alhambra Palace in Spain, with several outdoor patio, relaxation areas and reflecting pools, is located at the top of 79 steps, offering a stunning view of the sea from arched areas. With 33 treatment rooms, a gym, a sauna, and a relaxation temple, The Wellness Centre at BodyHoliday, lists a wide range of specialized treatments, executed by a group of highly professional wellness practitioners from around the world. From Bhutanese Massage to Osteopathy and more, you’ll find a wealth of fascinating holistic therapies. The popular Exotic Lime and Ginger Salt Glow cleanses and sooths dry and sun-damaged skin, and the Deluxe Coconut & Spice Combo for back, neck, head and scalp, uses the essence of the island to soothe stressed muscles and calm the mind. At the Wellness Centre, guests can enjoy healing treatments such as reflexology and acupuncture. The final stop at the Centre may be the Specialist Skin Clinic, which specializes in skincare treatments incorporating LaTherapie products. On the grounds of BodyHoliday, guests can enjoy a pool, tennis courts, a golf course and putting green, an archery range, and an outdoor Jacuzzi. Landsports and watersports of every kind are offered: fencing, volleyball, archery, stretching classes, aerobics, snorkeling, windsurfing, waterskiing, sailing, kayaking and extraordinary scuba diving. Body Guides are trained staff members who provide a physical fitness and nutritional assessment and recommend activities for guests as part of the BodyAware program. "Body Guards" are staff members trained in various sports and fitness activities who coordinate and oversee health programs. The 155 rooms, including suites and junior suites, with their white-washed walls and wood furniture are designed to be centers of peace and quiet. 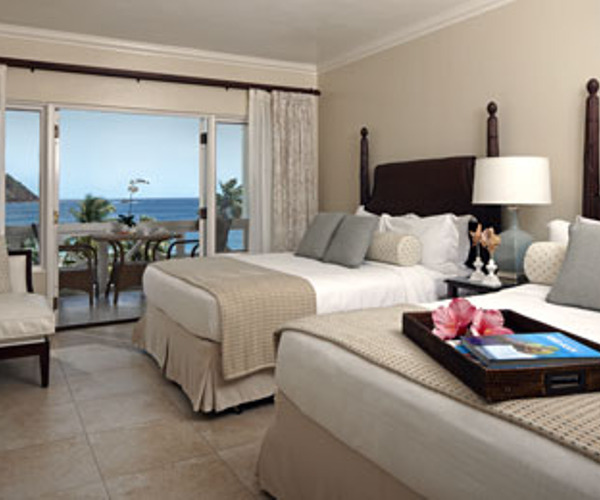 Many rooms have terraces overlooking the sea, and some are facing lush tropical gardens. The reduced-rate single rooms for solo travelers are luxurious and cozy. There are no TVs in sight, but guests can stay connected at the Internet Cafe. The Clubhouse also features a huge television. Rooms all have air conditioning, hairdryers and radio. TAO: This restaurant engages the senses with a balance of an unexpected combination of ﬂavors from East and West. Cariblue Restaurant: offers a cornucopia of international cuisine supplemented by special menus for Yoga and other themed menus. Windows: A tasting menu of new creations from the BodyHoliday culinary team is on offer at this restaurant. Pavilion Grill: Located at the Clubhouse offers an informal but tasty range of grills and clay: oven fresh pizza. Deli: Fresh salads, wraps and smoothies are waiting for you at the Deli made with organic fruits and vegetables picked from our own garden. Ital: Our latest restaurant. A small restaurant where guests can have the experience of Ital cuisine. Enjoy the freshest of ingredients by foraging your own from our organic farm. Then prepare them with the team at I-Tal – a journey of wellness and West Indian culture. Special theme months, such as Octoba Yoga BodyHoliday becomes the ultimate yoga retreat. Designed for everyone from the beginner to the more advanced, the month-long programme of activities, led by experienced teachers, offers limitless lessons from sunrise to sunset–featuring Hatha, Ashtanga, Shanthi and Katti yoga and meditation classes. The holiday includes a dedicated menu of yogic foods and teas served at restaurants throughout the resort, as well as an array of special massage and therapeutic treatments at The Wellness Centre.